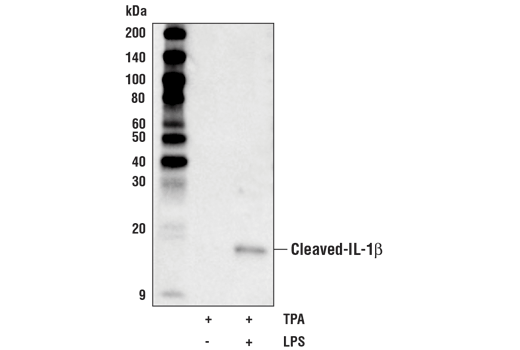 Western blot analysis of extracts from media collected from THP-1 cells, differentiated with TPA #4174 (80 nM, overnight) and subsequently treated with (+) or without (-) Lipopolysaccharides (LPS) #14011 (1 μg/ml, 6 hr), using Cleaved-IL-1β (Asp116) (D3A3Z) Rabbit mAb (Biotinylated). Cleaved-IL-1β (Asp116) (D3A3Z) Rabbit mAb (Biotinylated) recognizes endogenous levels of mature IL-1β protein only when cleaved at Asp116. Monoclonal antibody is produced by immunizing animals with a synthetic peptide corresponding to residues surrounding Asp116 of human IL-1β protein. This Cell Signaling Technology antibody is conjugated to biotin under optimal conditions. The biotinylated antibody is expected to exhibit the same species cross-reactivity as the unconjugated Cleaved-IL-1β (Asp116) (D3A3Z) Rabbit mAb #83186. Interleukin-1β (IL-1β), one of the major caspase-1 targets, is a multifunctional cytokine that is involved in a host of immune and proinflammatory responses (1). It is produced primarily by activated monocytes and macrophages. It signals through various adaptor proteins and kinases that lead to activation of numerous downstream targets (2-6). Human IL-1β is synthesized as a 31 kDa precursor. To gain activity, the precursor must be cleaved by caspase-1 between Asp116 and Ala117 to yield a 17 kDa mature form (7,8). Detection of the 17 kDa mature form of IL-1β is a good indicator of caspase-1 activity. Dinarello, C.A. (1998) Int Rev Immunol 16, 457-99. Burns, K. et al. (1998) J Biol Chem 273, 12203-9. Cao, Z. et al. (1996) Nature 383, 443-6. Cao, Z. et al. (1996) Science 271, 1128-31. Wesche, H. et al. (1997) Immunity 7, 837-47. Ninomiya-Tsuji, J. et al. (1999) Nature 398, 252-6. Thornberry, N.A. et al. (1992) Nature 356, 768-74. Cerretti, D.P. et al. (1992) Science 256, 97-100.